Your Lake Placid Memorial Library presents its free spring concert, this year featuring Castlebay. Castlebay previously visited your Sebring Public Library six years ago and left such an impact that I knew I had to bring them back. 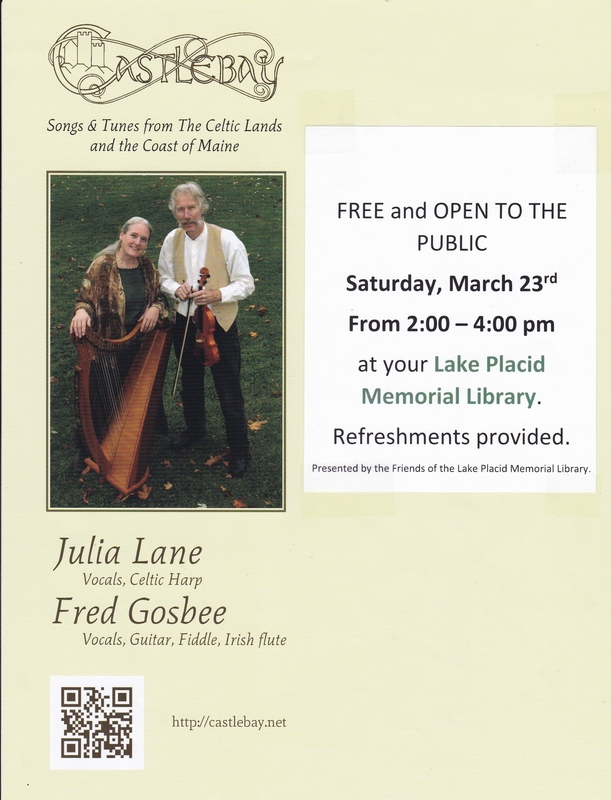 Through the generosity of the Friends of the Lake Placid Memorial Library, this year they will be performing “BARDS & BLARNEY – IRISH TUNES & TALES” from their album of the same name. Bards & Blarney features ancient Irish poems and stories accompanied by Irish harp plus songs of wonder and transformation. “Castlebay has toured the Eastern U.S., Ireland, England and Scotland playing at festivals and arts centers, as well as on radio and television. The duo maintains a commitment to cultural education, exchanging music and lore with colleagues. They provide folklore and music programs for schools, museums, libraries and Elderhostels exploring Celtic lore and tradition throughout the eastern US and the British Isles. The duo has released 27 recordings, including both original and traditional songs, Christmas harp recordings, and the “Tapestry” collection, a 6-part instrumental series.” You can find more information on the artist at www.castlebay.net. The concert will be held outdoors in the back garden on Saturday, March 23rd from 2:00-4:00 pm. The event is free and open to the public, with refreshments provided. We at your Lake Placid Memorial Library hope you will join us for what is sure to be an engaging and beautiful concert!